Early British feminist Mary Wollstonecraft (1759-1797) was a revolutionary thinker who sought to become “the first of a new genus,” a new kind of woman. Her life, though short and tumultuous, was characterized by an Enlightenment-inspired passion for reason unusual among women of her era. Historically, many people have been more interested in Wollstonecraft’s unusual personal life and associations than her writing. Raised in a financially unstable home dominated by a violent, alcoholic father, she was no stranger to hardship. Later relationships would also prove difficult, as when the father of Wollstonecraft’s first child abandoned her with the infant in France in the midst of the French Revolution (1789-1799). But Wollstonecraft’s vision of a social order founded on reason and women’s education would become her lasting legacy. Though denied educational opportunities beyond the superficial schooling allowed to girls at the time, Wollstonecraft loved to read and yearned for intellectual life. Dissatisfied by the restricted career choices then available to women, she made the radical decision to support herself as a professional writer, something very few women of the time could do. 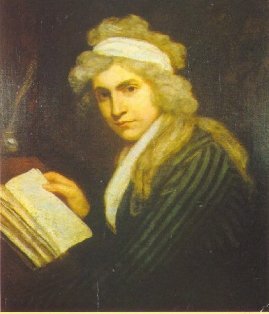 Wollstonecraft’s career choice, and especially her decision to write about political and philosophical issues, was not merely unconventional, it was perceived as “unwomanly” and “unnatural.” She, on the contrary, would argue that both women and men should be educated rationally, allowed to exercise their natural abilities, and held to the same reasonable standards of behavior, because women share the gift of reason and have the same innate human value as men. A Vindication of the Rights of Woman, her most famous work on these themes, was a remarkably cutting-edge book in 1792, arguing, for example, that girls and boys should be co-educated and that women and men should share parental responsibilities. A Vindication of the Rights of Woman became an inspiration for later generations of feminists. Susan B. Anthony serialized it in her own newspaper, The Revolution, and Anthony’s personal copy of the book resides in the Susan B. Anthony collection of the Library of Congress.